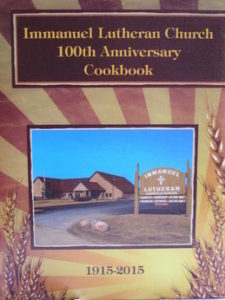 The Men of Immanuel serve a Fried Chicken Dinner and all the trimmings on a Sunday every June after Church from 11am – 1 pm. Cooked at Charlies Up North by Charlie and Deb Thompson and crew. Check the Calendar for the exact date. Immanuel Lutheran School holds their Annual ABC Sale on the second weekend of June each year. Basically it is a huge garage sale that they start setting up right after the Men of Immanuel’s Chicken Dinner is done and work through Wednesday night to set up. Thursday morning the doors open to one of the largest garage sales in the area. The times for the sale are Thursday, 8 am-6 pm; Friday, 8 am-6 pm; Saturday, 8 am- Noon. The Men of Immanuel serve a Hog Roast Dinner and all the trimmingson on a Sunday every June after Church from 11am – 1 pm. If you wish to donate fresh flowers on the altar the cost is $25 for two weeks. There is a flower calendar on the bulletin board. The 100th Anniversary cookbooks have arrived. They turned out really nice. They are a 3- ring cookbook with a hard cover, nice heavy dividers and 431 recipes. They include some of the churches history for the last 100 years. The cookbooks are selling for only $15.00, if we need to mail them, there will be a $6.00 shipping fee added to the $15.00. We will be selling them before and after church services. You may also pick up from the church office. These cookbooks are a great and easy gift for any occasion. Any questions or to request your copy/copies, you can call Barb Vinkemeier: 952-657-2121; or email: barbvink1@gmail.com or the church office:218-547-3156. Thank you for your support! The Lutheran Social Services senior nutrition program cooks up some really good meals at 11:30 every Monday- Friday at the Senior Center in Walker. Low-cost lunch is available for anyone. Just call 547-4181 to make a reservation. The monthly 2 piece Walleye Dinner for #15 a person will be the fourth Friday of each month from 5-7 pm. Everyone is welcome to come. LWML has wonderful birthday, get well and sympathy cards ready for purchase for $1 each. Check them out in the card rack. Corina is in need of expired incandescent light bulbs of any size if anyone has any. Printed copies of Sunday’s sermon are available at the entry from the ushers after Church. Please ask Pastor about copies available of past sermons.